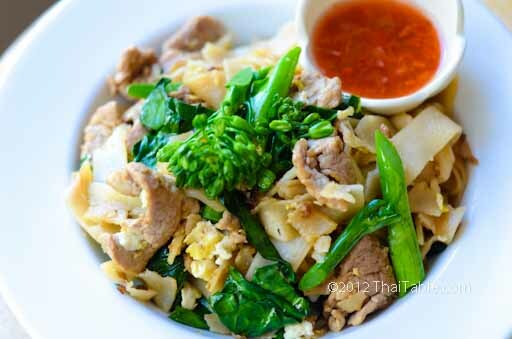 Pad see ew is a standard lunch fare among Thais and is very popular dish in Thai restaurants ouside of Thailand. The soft, chewy rice noodles pan fried with pork, Chinese broccoli and soy sauce, is a comfort food for many. The noodles can be made hot at the table with chili garlic sauce. Pad See Ew is simple to make and the ingredients required are relatively easy to find. 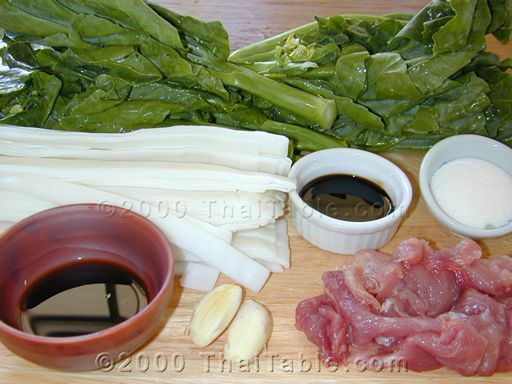 If you check Pad See Ew's ingredient, you'll see how similar it is to Rad Na. Your extra ingredients can turn into another dish! For a vegetarian version, skip the pork. Add firm tofu if you like. 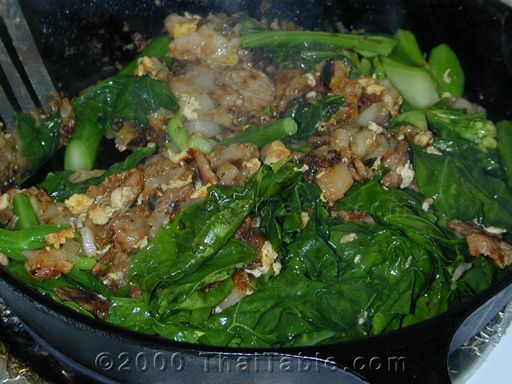 I often enjoy pad see ew with just the egg. Dark soy sauce gives the noodles the color while light soy sauce seasons the dish. If Chinese broccoli is tough to find where you live, try kale or regular broccoli. 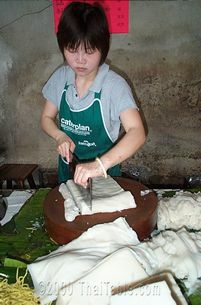 If your fresh flat rice noodles are not pre-cut, cut them into strips of 3/4 inch wide. If your fresh noodles came out from the refrigerator, heat them up in the microwave first. Cut Chinese broccoli into 2 inch long pieces. Halve the stems lengthwise because thick stems take longer to cook. You are going to want to cook them at the same time. 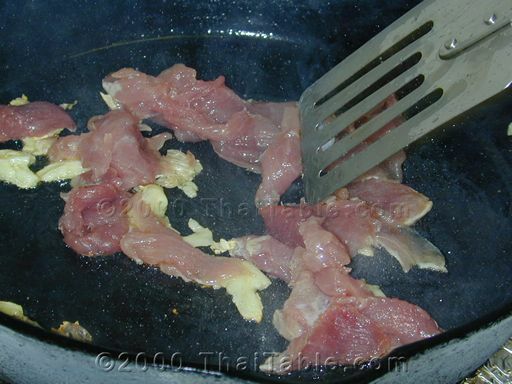 Heat a wok to high heat and then add 2 tablespoons of oil. Drop in the chopped garlic and stir. Add the sliced pork. 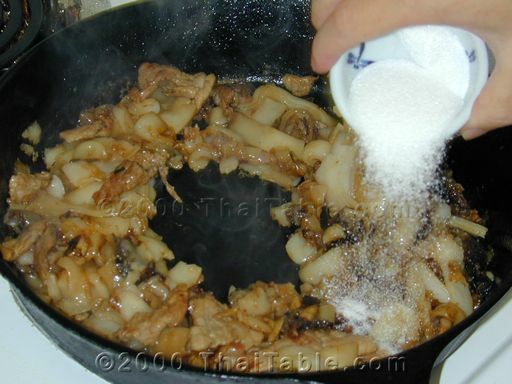 Stir to cook the pork. 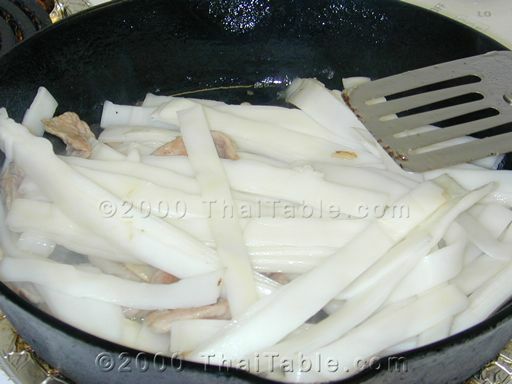 When the pork is somewhat cooked or turned from pink to light brown, add rice noodles. Stir to break up the noodles. Add light and dark soy sauce and sugar. Stir to mix the seasonings into the noodles and pork. 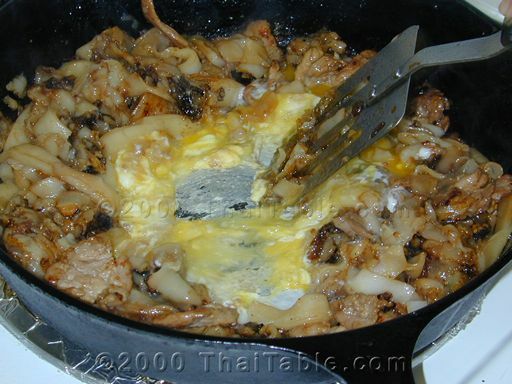 Open a spot in the middle of the pan, and drop the egg in. Scramble the egg until it is almost all cooked (not watery any more). Fold in the noodles and mix them all. Add the Chinese broccoli, stems first. I usually add half of the Chinese broccoli and stir until it wilts and then add the rest. But if you have room in your wok, you can cook all the Chinese broccoli at once. As soon as the Chinese broccoli is cooked, turn off the heat. Put on a serving plate and sprinkle white pepper on top. Serve with the usual noodles condiments; sugar, fish sauce, vinegar and dried ground chili pepper. I usually like mine with ground chili peppers and vinegar. Pad see ew that you find in Thailand is little sweeter than mine because many street vendors add more sugar than I prefer. Have you noticed that Pad See Ew's ingredients are similar to Rad Nah ? Use red pepper only to get the vibrant red sauce. Peel garlic and cut the stem off from pepper. 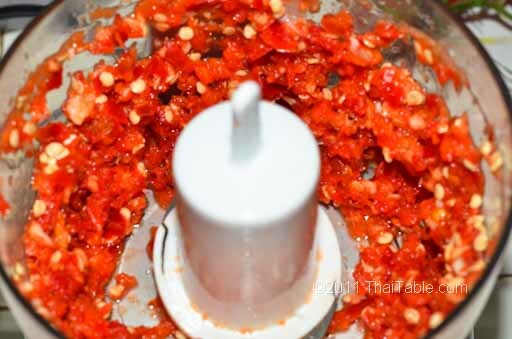 Add garlic, peppers and salt into food processor. Chop the peppers until they are roughly ground. Scoop out the mixture into a jar. Pour the vinegar in. 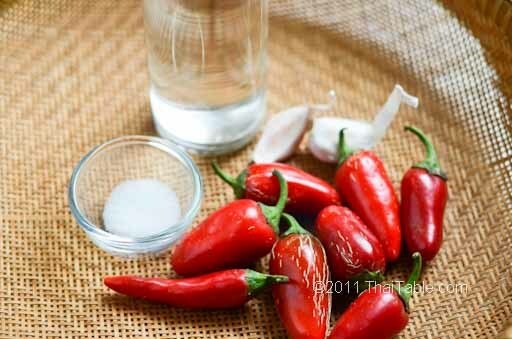 The vinegar should cover the pepper mixture. 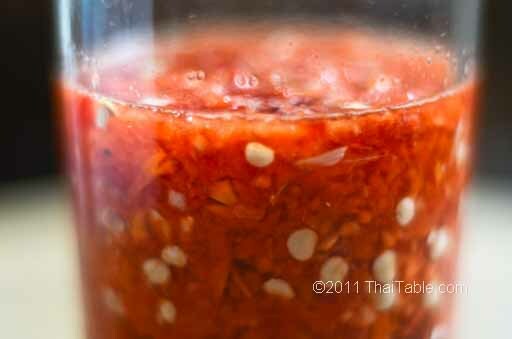 The chili garlic sauce will thicken over time. You may need to add more vinegar to keep the mixture submerged.